People often think about the backup when it is too late. For example, parents start thinking about the backup and recovery when their phone is lost. Perhaps computer with family pictures gets infected with a virus. On the other hand, IT Administrators are people who protect assets of the company. Their job can be quite difficult. Often, cuts in IT budgets or low IT budgets prevent them doing their job like they were supposed to. How can you backup company data if you have no money to buy quality software, backup media, and the proper server? It is tough. Admins who are lucky and don’t have those issues don’t understand how lucky they are. Furthermore, IT Admins can also inherit low-quality backup solution which was bought not so long ago. You can’t just throw that software away, what will the boss say after all? I was lucky enough to experience all the mentioned scenarios. I was working in a company with literally no money dedicated to IT, yet it was expected of me to perform the same tasks with the same quality as the mates in companies with practically no limits to the IT spend. I also inherited the backup solution which was crap and was not working properly, had issues with backup, with restore and it affected server performance. And I was also happy to work in a company with dedicated fond dedicated to IT, and we never had a situation when we could not buy something if we wanted. In the old days, having a tape was necessary for a backup. There were no cheap NAS devices, hard drives didn’t have the capacity of hard drives of today and backing up a file server was a challenge. If you wanted to back up a server image for faster server restore was also a challenge. Using backup software like Symantec Backup Exec only made things worse. It could happen easily that software was working fine but when you had to do a restore you discovered that: a. software had a bug in the version you were using and the backup was not done properly or b. the tape had issues and couldn’t be used to do recovery. Another issue was how to backup data from various employees. How do you back up a laptop? How do you backup stationary computers, where do the backup a directors laptop? Tape? File server? What solution do you use? Do you have the budget? How will you manage the backup process? How will you manage data? Ransomware epidemic has really shown the importance of a good backup solution. The punishment was fierce, encrypted data, money and time loss. Data was lost unless you paid hefty money – if you were lucky. Sometimes you wouldn’t get a decryption key even after the payment was done. 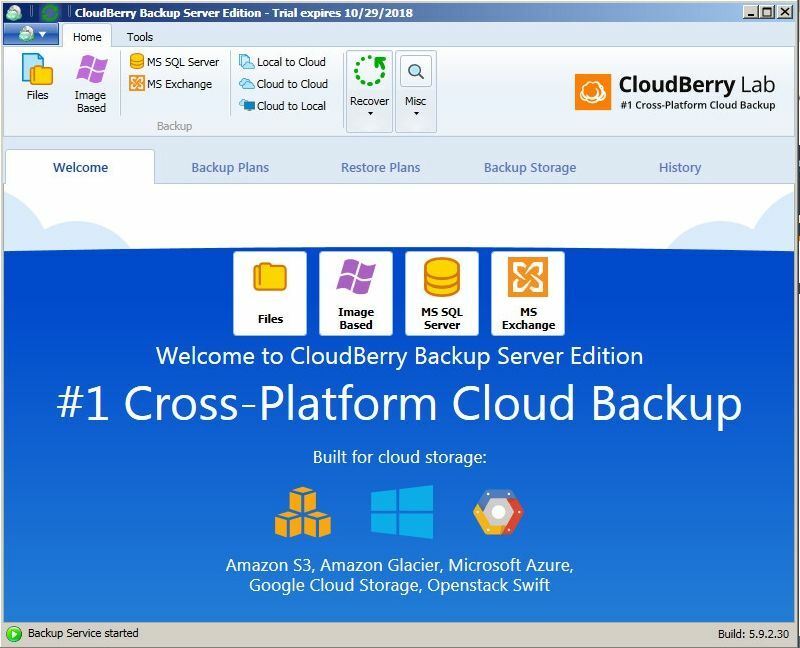 CloudBerry Backup is available in several editions. 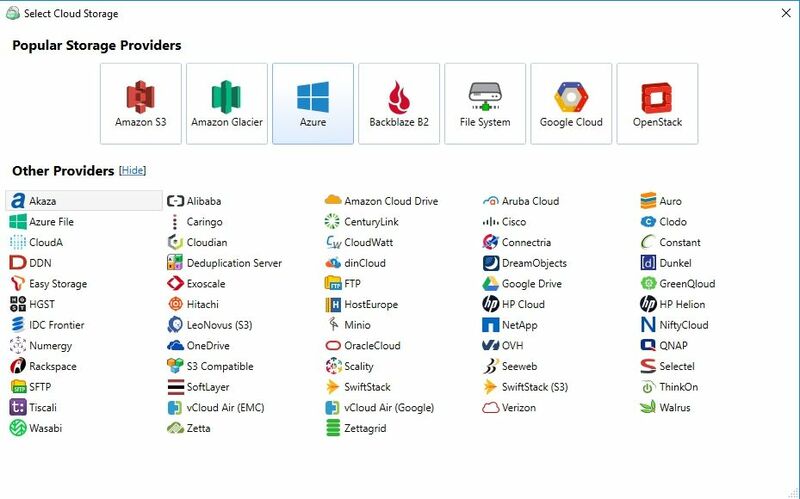 They offer Desktop Backup, Server Backup and Apps Backup (Google apps and Office 365). Desktop edition is available for Windows, Mac, and Linux! It is available in two editions: Freeware (free for home use with some limitations) and PRO version which enables image-based backup, compression, and encryption. You can back up one share in both editions. If you think that free edition is useless, you can trust me that it is a pretty solid product. If you don’t need encryption you can still backup files to the cloud, to the many cloud services CloudBerry supports. Selection is darn exceptional as it supports most if not all them. My favorite is Backblaze, it is very affordable both for home use and for business archiving. For example, 1 TB of data is just $5 per month. Cloud transfer is limited to 200 GB in the free edition and 5 TB in Desktop PRO edition. When you need to transfer more than 5 TB of data, you can choose the Ultimate edition. CloudBerry Server backup is available for Microsoft Server and Linux Server. You can select from several editions. Server edition can be installed on a Windows Server 2003 and newer. It has support for System State, File system and Image-Based backup. It supports Bare Metal Restore and even Restore to Cloud VM. You can use it to backup Domain controllers, File and Print servers. Furthermore, you can backup any server. You can include 5 shares to the backup and you can transfer 1 TB of data to the cloud services. If you are a user of MS SQL Server and/or MS Exchange, CloudBerry has a special dedicated version for each server. MS SQL Server edition has built-in support for MS SQL server and MS Exchange edition has support for MS Exchange. Unlimited edition like the name implies has no limits and supports both Microsoft Exchange and MS SQL server. It also has no limits on the number of shares you can backup and it does not impose any limit to the data transferred to the cloud. What about the pricing? Pricing is pretty awesome actually. Ultimate edition can be bought for $299,99. This version is without limits. But I guess you don’t need Ultimate edition for every server. If you self-host MS Exchange, price for the CloudBerry MS Exchange edition is $229,99, the main benefit of Exchange edition is that when you need to recover, you can recover individual items, like emails, contacts….. If you have a Microsoft SQL server, the price for the SQL edition is $149,99. Again, one of the benefits of the SQL edition is that you can recover individual items. But if you would like to backup Windows server, for example, file or a print server, you will love CloudBerry Server edition. For example, when you have any kind of applications installed on the server, you can use server edition just as easily, as CloudBerry supports Microsoft VSS for proper snapshot procedure. That way when the backup is done, VSS will ensure for backup integrity. CloudBerry Backup features are top notch. One of the built-in features of CloudBerry Backup is Ransomware protection. It detects encryption changes in files and prevents existing backups from being overwritten. Only when Admin confirms, it will overwrite data. So that is a protection built in right into the product. Part of security is also 256-bit AES encryption which can secure the backup. In order to save space, CloudBerry has an option to apply special compression to decrease storage costs. It will also save the bandwidth and speed up the backup process. In order to save the storage cost, even more, the product has Block Level Backup support. That means that it will only backup modified or new portions of files and include them to existing data pools. One of the strongest assets of CloudBerry Backup is its Cloud support. Not only that it supports literally every major cloud services. You can also do wonders. For example, you can back up a server to a local repository but send only a subset of your data to the cloud. You can backup data from one cloud storage location to another. Or you can use multiple storage locations to keep your data. You can also automate Windows serve cloud backup to a local storage be it external or a network drive. Image-Based backup is an essential part of the CloudBerry and with all the Cloud Support, it is only natural to have this amazing option called Restore to the Cloud VM. If your local infrastructure goes down, for example, by a flood which could destroy your data center, you can easily restore directly to the Cloud VM. You can use your server images and can deploy them as Amazon EC2 or Azure VM instances. That way you can be operations within just a couple of simple steps. You can set up a schedule for your backup like hourly daily, weekly or monthly, but you can also set up a real-time backup of the most important assets. To be sure about backup completion, you can set up email notifications. 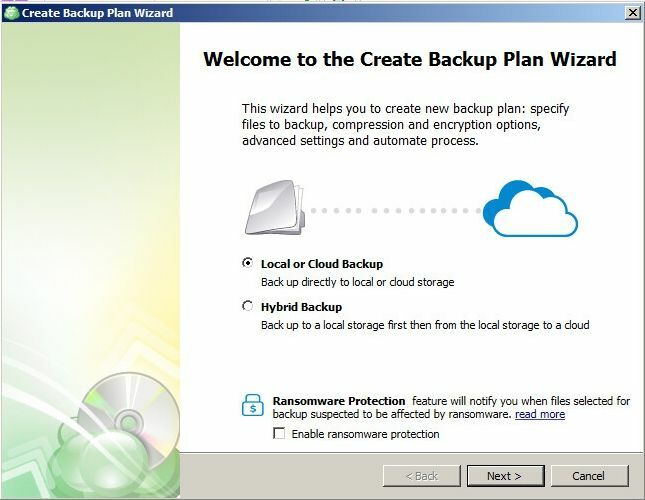 Just to be sure that backup cant be deleted accidentally, you can set up retention policies. You see, this is the part where competing products stop showing all the features. But this is also a part where CloudBerry just begins listing all the benefits. When you have a backup product. Sure, the main feature of a product should be reliability. So that you don’t have to worry if the backup was completed. Once you have that covered, it is in your interest to have a product which will cover all the data, from servers, directors laptop, workstations even file shares on the NAS server. If you find a product that does all of that, the next phase is to manage all that with one product, a console which gives you a complete overview about data integrity of all the assets in your company. Cloudberry Labs has developed a feature called CloudBerry Managed Backup. It is listed as a product for MSPs, but don’t fear. If your organization is of a size that you think about such a solution, just read the fine print and you will see that it is listed for corporate use well. If you find a company that has all the listed benefits, then we reach the last phase of a truly amazing product. What I like about the backup is also the ability for the product to save money. How can the backup program save money? I mean, you have to buy the licenses and all? You see, this part is the best actually. While CloudBerry has built in various algorithms to compress data and backup just the changes, the CloudBerry lab, has built another product which means revolution for the space saving in the cloud and on the local network. They have built a real deduplication server which you can install on one of your servers. Once installed you can publish servername to the active directory which enables clients to find repository automatically. The main benefit of this server is that you can use one server to deduplicate data and send that data to various locations, from the network share to the cloud. But because deduplication server was engineered with the cloud in mind, you can send deduplicated data to the cloud repository. Since the data is deduplicated you will save on the storage cost that you pay to the cloud vendor. When you have a lot of data, you will appreciate the savings trust me. And the cost of the duplicated server is only $299,99. CloudBerry means business. The product is pretty amazing, has a great cloud support and can do wonders in case your data center goes down for good. You can be up and running in the cloud in a matter of minutes and that is what it counts when you have a problem. In case you already have a decent backup in place, you can use CloudBerry to backup your data to the cloud. Not only that you can save some money in the process, but you can also ensure your disaster recovery and business continuity as you can restore in the cloud easily. Pricing is superb for such a product and as I said, you can only use it for a backup to the cloud. But if you are looking for a product which will back up your personal computer and keep the memories safe in the cloud and on an external USB drive, look no further. CloudBerry is available as a PRO or even a FREE product. Give it a try, you won’t be sorry.